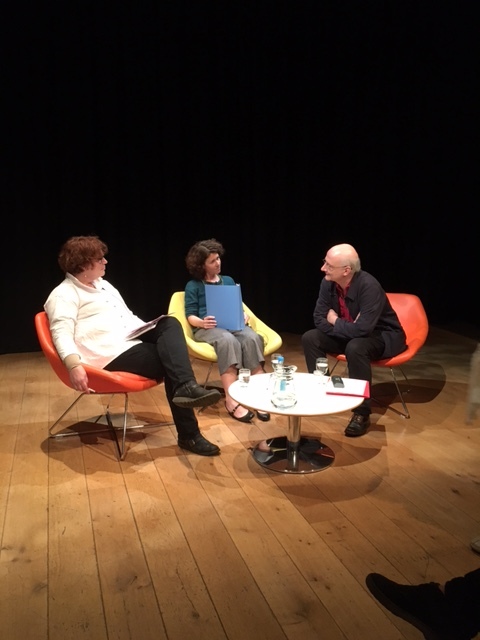 Winchester Poetry Festival Diary: What isn’t translation? Day Two of Winchester Poetry Festival started in the Children’s Library at Winchester Discovery Centre. MPT Editor Sasha Dugdale and Access consultant Shelley Boden ran a session which introduced children to poetry (for children) in translation, “Poems from different countries can tell you things in a different way,” Sasha told the young participants. “When you read poems from other countries you become an explorer of other countries.” Before listening to and reading an English translation of a Russian poem, Sasha asked everyone to close their eyes and listen to the poem in its original language. “Listen to the music of the Russian, even if you don’t understand the language – although, do you any of you speak Russian?” A wonderfully enthusiastic and happy boy aged about six shot his hand up, much to the surprise of his parents who had no idea about his linguistic talents. Later in the day, listening to poems by Jan Wagner and Raoul Schrott read in their original German, I took Sasha’s advice but found that my brain refused to find music and instead searched for meaning, trying to pick up words which I might understand, wasser/water, for example. Saturday was a day to think about translation, understanding, sound, meaning, and misunderstanding. In the ‘Translation Duel‘, two eminent translators of German poetry, Karen Leeder and Iain Galbraith, translated the same poem, Mitad del Mundo by Raoul Schrott. “Everyone has a different slant to literature and I hope that is something that will come out of this duel,” Sasha said, introducing the event. Iain and Karen talked about the philosophy of translation. “There is no such thing as a correct translation,” said Iain. “Everything is open to interpretation. Everything is participatory. We are all involved in creating meaning. You have to ask ‘what is not a translation? '” Ideas about the unfixed nature of meaning surfaced in reading after reading throughout the day. It seems natural for poets to be attracted by ideas in translating, whether or not they are speakers of other languages. The whole process of writing poems is somewhat to do with translating ideas from their heads into words on a page and deciding how much help they will give their reader or how willfully complicated they will be. It wasn’t surprising that so many festival poets referred to their delight in the ‘Translation Duel’. You can read the poem in its original German and the two different translations here. Winchester Poetry Festival Diary: Day One (Part Two).